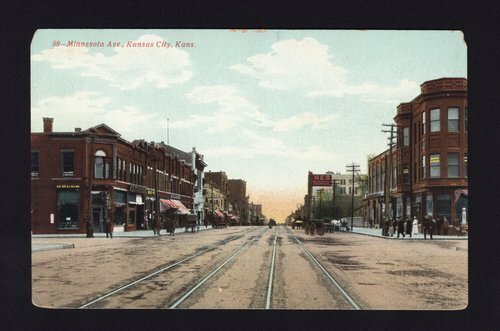 This colored post card photograph shows a view of Minnesota Avenue looking east from 7th Street in Kansas City, Kansas. The corner store on the left side is the Cartwell Drug Store. A sign for another drug store is partially visible behind a utility pole on the right side of the street. Several other business buildings are visible along the street. Several people are visible on the sidewalks, and several horse-drawn carriages are visible in the street. Tracks for the trolleys are also visible running along the street.